As their name suggests, Öresund Space Collective are based on both shores of the straits separating Denmark from Sweden (now spanned by a bridge opened in 2000). Founded in 2004 by keyboardist Scott Heller (aka Dr. Space), they are a multinational group of over 30 musicians who are also members of other bands. Their loose configuration reflects the totally improvised nature of their music, and their lengthy jam sessions have provided material for numerous CD, LP and DVD releases (many of them recorded live during their extensive European tours). The flame kindled decades ago by legendary bands such as Hawkwind and Ozric Tentacles is kept alive today by a myriad outfits and solo projects that maintain a strong network of connections. This thriving psychedelic/space rock scene seems to be particularly lively in northern Europe, though it has a keen following in other countries as well (including the US) – and that in spite of being undeniably an acquired taste. Indeed, the subgenre’s quintessentially loose, unscripted nature runs counter to the highly structured, tightly arranged quality of traditional progressive rock. Öresund Space Collective’s uncompromising approach has made them very popular with dedicated fans of space rock. With over 10 albums released since their debut in 2006, you would expect the band to stick to a tried-and-true formula – a bit like Ozric Tentacles have done throughout their career – and therefore any of their albums to be a worthy “gateway” experience for the newcomer. On the other hand, while OSC have their own recognizable sound, they are also capable of branching out with less predictable productions – as witnessed by one of their most recent releases, the excellent West, Space and Love, strongly influenced by Indian music. Dead Man in Space originated from sessions played by the band in 2008, which also provided material for two other albums, Slip Into the Vortex (2010) and Sleeping With the Sunworm (2011) It was originally released as an LP in January 2010, then reissued in CD format with a longer version of “High Pilots” (here clocking in at a hefty 32 minutes instead of just 22) and an additional track, the 10-minute “Who Tripped on the C(h)ord?”. With the exception of the short title-track, which closes the album with a collection of whooshing electronic effects and a muted recorded voice relating the tale of the titular dead man in space, all the tracks follow a similar template. Over a steady, unflagging bass/drum backdrop, electronics and guitar take turns in the spotlight, describing hypnotic cadences designed to evoke the mystery and vastness of space and expand the mind almost like an LSD-fuelled trip. The somewhat raw sound quality adds to the appeal of the music, increasing the impact of the swirling guitar patterns underpinned by the low rumble of the Hammond organ. The sprawling 32-minute guitar-synth jam of “High Pilots” offers a series of variations on the same mid-paced, trance-inducing theme. Though the weird electronics may occasionally be annoying, the subtle shifts in tempo and the alternating roles of the two main instruments hold the listener’s interest – though in a markedly different way than the twists and turns of a conventional prog “epic” of the same length. The 22-minute “Space Jazz Jam 2.2” is exactly what the title promises – a slow, surging duel between guitar and sax in the best Hawkwind tradition, with a tantalizingly mellow hint of Eastern spice contrasted with the increasingly distorted growl of the guitar. “Who Tripped on the C(h)ord?” makes effective use of the muted, chiming pace of iconic Pink Floyd compositions such as “Careful With That Axe, Eugene” or “Set the Controls for the Heart of the Sun”, bolstered by eerie organ runs and whistling synth to create a melancholy, meditative mood. 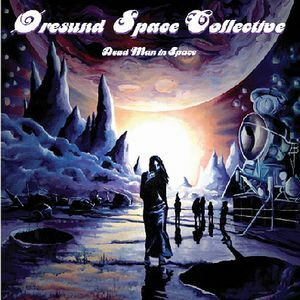 Dead Man in Space is a must for fans of vintage psychedelic/space rock, as are all of Öresund Space Collective’s albums. While a bit too rambling and unpolished (and perhaps monotonous) to suit the tastes of the more traditional-minded prog fans, it will provide a refreshing change of pace from the often overwrought efforts of far too many celebrated artists. On any account, Dead Man in Space provides an interesting insight into the work of one of the leading bands of the current space rock revival, and a celebration of the joys of improvisation – so often stifled by circumstances.